Handy and lightweight vacuum goes wherever your vehicle goes. The 9 foot cord plugs into your cigarette lighter/12v outlet, so no need for external power. At less than 4" wide and under a foot long, it's easy to stow. Keep it in the car and never be unprepared when a mess arrives uninvited! Package includes an attachable crevice tool so you can reach narrow problem areas like the space between front seats and center consoles. The removable filter is simple to empty and maintain. The entire process only takes seconds and you're back to cleaning. This vacuum cleaner is immaculately designed. An ideal product for promotional purposes and gifts. Special Order 1000 large quantities at half price. Put the DV 12V plug into the cigar lighter of your car. Power the switch on. Then get to work. 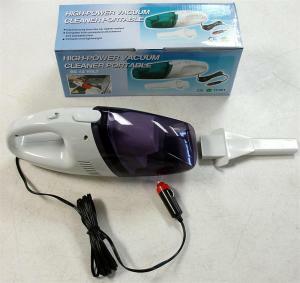 Thermax Turbine Powered Hand Wand, Designed to vacuum hard to reach areas, carpeted stairs, and vehicle interiors.